Mayor Sylvester Turner led the Parade of 143 units, with his daughter Ashley. 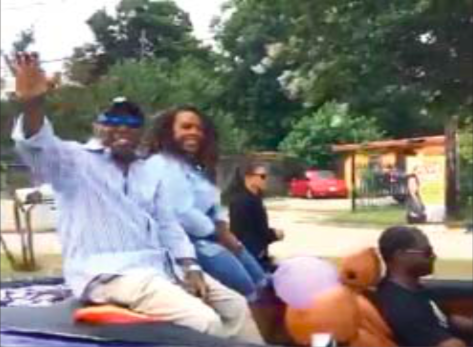 Houston Mayor Sylvester Turner celebrated Juneteenth with his 7th Annual Juneteenth Parade in Acres Homes last Saturday, June 16. The parade featured over 140 participating groups and organizations, including local marching bands, dancing groups, horses, floats, vintage cars and more. A number of special guests participated and there were giveaways to spectators. The parade began at 10 a.m. at the Acres Homes Multi-Service Center, 6719 West Montgomery, and traveled north up West Montgomery to turn left on Dolly Wright and disband at Greater Zion Baptist Church and Drew Academy. – UniverSoul Circus — The circus featuring performers from 24 countries will bring acrobats, clowns, stilt walkers and more to the parade. They will hand out tickets to their performances which run through June 24 at Butler Stadium. – Z-Ro — This Houston rapper has released several albums. – Seun Adigun — Seun is a Nigerian-American bobsledder who represented Nigeria at the 2018 Winter Olympics. Seun ran track for the University of Houston and is the niece of former Houston Rockets and UH star Hakeem Olajuwon. – Brian Courtney Wilson — The Houston gospel singer. – Clyde Drexler — The former Houston Rocket great is commissioner of the Half-Court Professional Basketball League. Four games of three-on-three competition will be held in Houston June 22 and Clyde is bringing game tickets to give away. – Vince Young — Former University of Texas quarterback and two-time Pro Bowler in the NFL. “Local churches and non-profit organizations adopted blocks along the West Montgomery parade route and brought out folks to cheer on the participants,” said Mayor Turner.